Following the European launch a few weeks ago, Zoetis UK has launched its new PRRS vaccine in the UK. 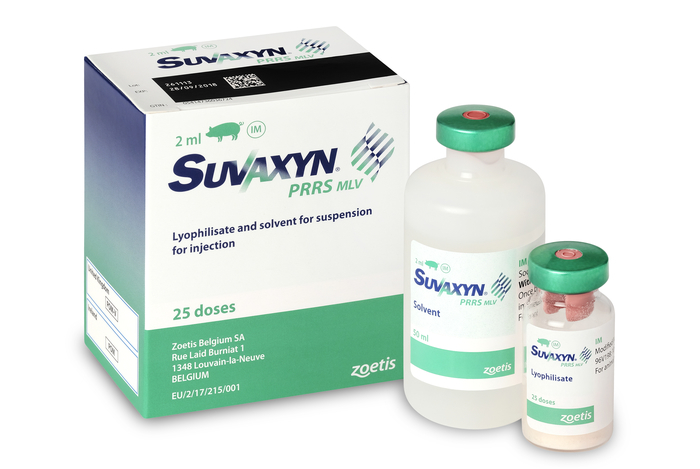 Suvaxyn PRRS MLV, which contains an attenuated European strain of the PRRS virus, can be administered from just one-day old, meaning that protection against the costly pig disease can be in place around weaning and will persist until slaughter. “We are really excited as vaccinating from one-day old means Suvaxyn PRRS MLV is the first vaccine to provide immunity around the time of weaning,” Zoetis UK’s National Veterinary Manager, Dr Laura Hancox, said. “It could really change the way that people manage their PRRS situation. The vaccine can be used from one day of age as it has been created in a unique new way that means it can create an immune response in the piglet even when maternal PRRS antibody is present. “We believe that other vaccines don’t have such an early indication for injection because maternally provided immunity would block the action of the vaccination in the piglets,” Dr Hancox said. “Antibodies would be circulating around the piglet that had been delivered through colostrum, and these would bind the antigens in the vaccine and stop the piglet making its own immune response. Other benefits of bringing the vaccination forward to the first week of life are that the procedure can easily be added onto other tasks carried out at that stage, handling piglets for vaccination is much easier when the piglet is smaller, and it removes the potential stress and growth check that can result from additional vaccination around weaning. “Trials carried out in the laboratory and on-farm, including on a unit in the UK, have shown no adverse systemic reactions to the vaccination, with no impact on mortality, and no impact on daily live weight gain, either pre- or post-weaning,” Dr Hancox said. It is licensed for gilts and sows as well. Zoetis’ Business Unit director for Pigs and Poultry in the UK, Ben Lacey, said that once again the company had let science lead the way in developing an effective and convenient vaccine that was fit for the 21st Century. “In Europe, PRRS is known for severe impacts on reproduction, including lowering birth rates, increasing abortions, stillbirth and mummification, as well as weak live-born piglets and increased pre-weaning mortality, it also has significant impacts on respiratory health and mortality rates through to finish,” he added.